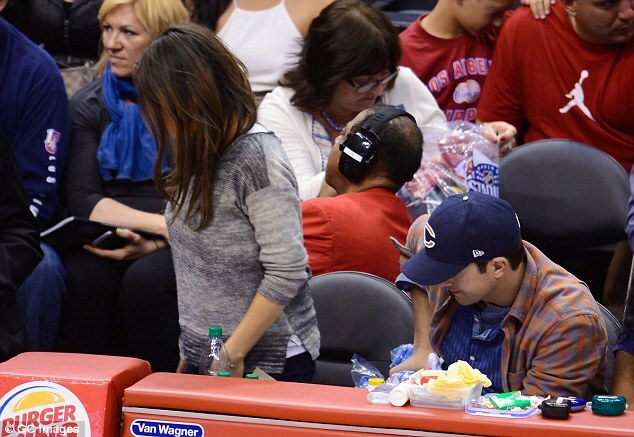 Ashton Kutcher and Mila Kunis puckered up on Saturday during the Los Angeles Clippers game at the Staples Center. 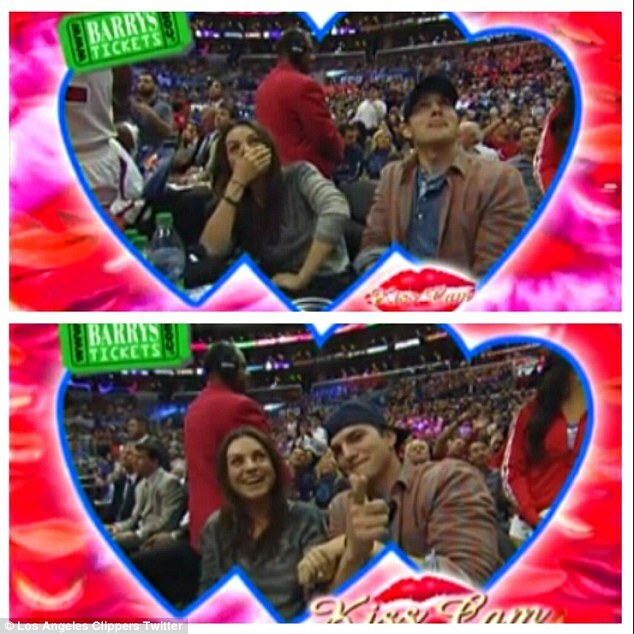 The adorable pair were caught on the Kiss Cam just hours before E! confirmed through a source close to the couple that they are expecting their first child, though the twins rumours are said to be false. 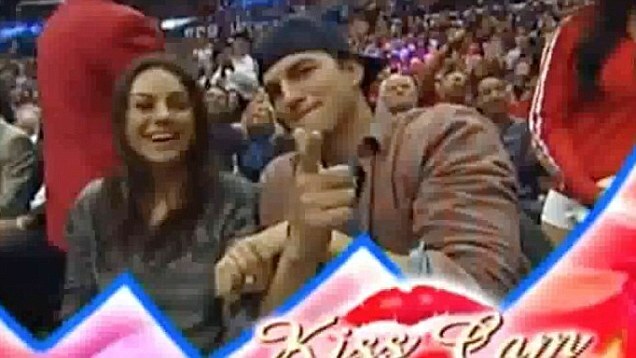 The 30-year-old actress – who has been spotted at a pre-natal yoga class in Los Angeles – seemed embarrassed when their faces were broadcast to the rowdy fans via the jumbotron. The Black Swan actress clutched her mouth when she realised they were being filmed, while Ashton looked rather amused. The loved up couple eventually warmed to the camera, smooching, albeit briefly, much to the delight of the cheering crowd. Perhaps proving to be good luck, their hometeam finished the game on top, beating the the Detroit Pistons, 112-103. But the night out mustn’t have been all kisses as the Black Swan actress seemingly attempted to silence her beau during the game, cheekily putting her hand up to his face. The sweet and down-to-earth couple always seem perfectly comfortable and content in one another’s company, with the 30-year-old not in the least bit shy about putting her man in his place when the need arises. Now that their engagement has been confirmed, the bride-to-be was only too happy to flash her dazzling platinum and diamond engagement ring for all to see. - estimated to be around 5-carats and worth upwards of $ 260,000 – as she caressed her man with her left hand and leaned on his shoulder. 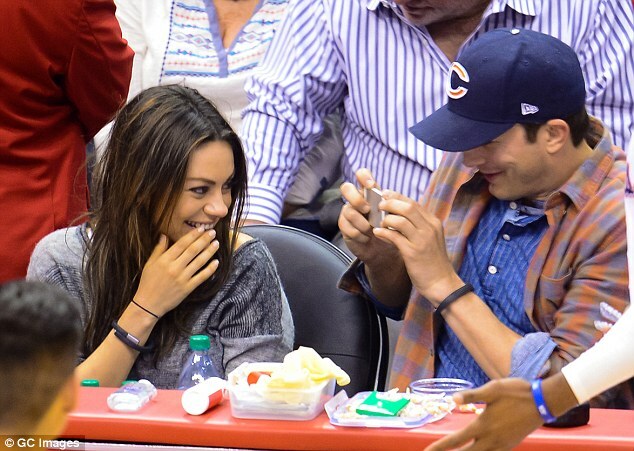 At one point, the 36-year-old whipped out his cell phone to snap a sweet photo of his lady love, who giggled into the camera, her right hand raised up to the side of her mouth. The couple displayed their complementary casual styles during their outing. 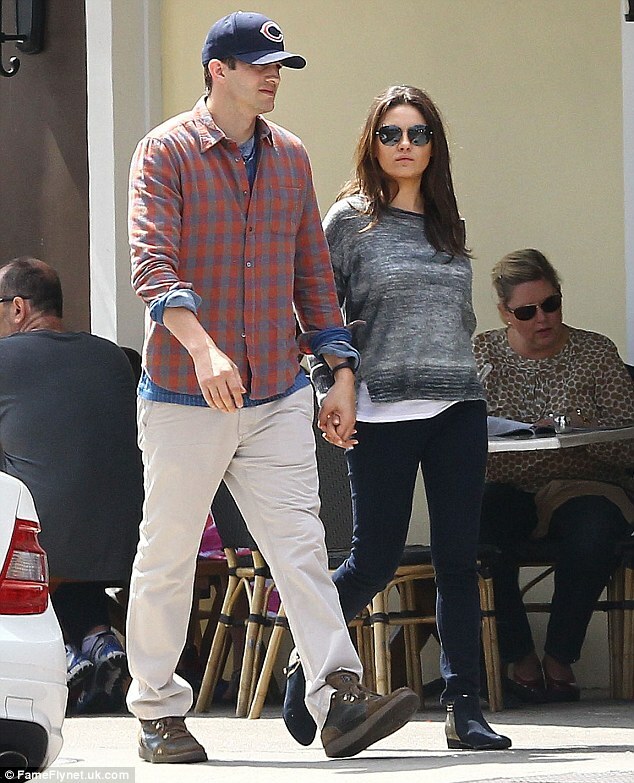 Mila donned dark blue jeans, matching flat ankle boots, a white T-shirt and grey marle jumper, her long brunette locks worn down in a simple straight style. She had just a minimal, natural covering of make-up enhancing her flawless complexion, with her lips left bare. 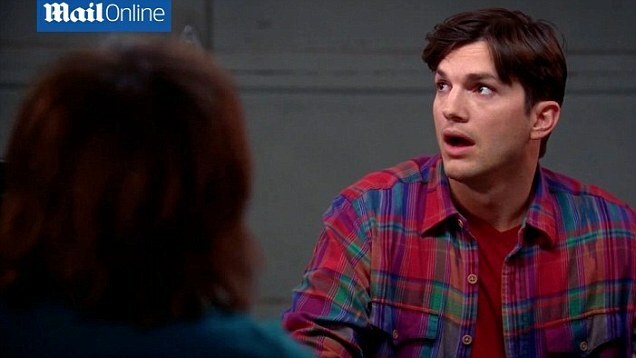 Ashton opted for cream-coloured pants, dark brown scruffy shoes, his favourite blue Chicago Bears cap and two layered blue long-sleeved tops with a red and blue checked shirt worn open over the top and rolled at the sleeves. Earlier that afternoon, the pair stepped out hand-in-hand to grab a spot of lunch at Sweet Butter Kitchen in Studio City wearing the same outfits. 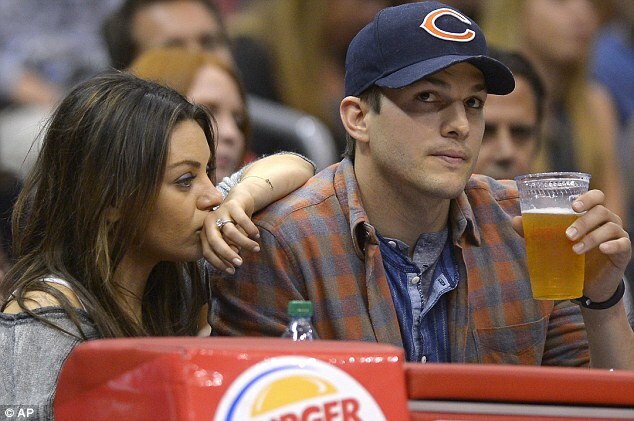 With pregnancy rumours continuing to surround the former That ’70s Show co-stars, the alleged mom-to-be gave nothing away as she remained covered up in her loose-fitting top – though perhaps tellingly, she stuck to bottled water during the basketball game while her beau nursed a beer. While the two are now deeply in love and preparing to make it official with a walk down the aisle, they apparently weren’t too fond of each other back in their That ’70s Show days. 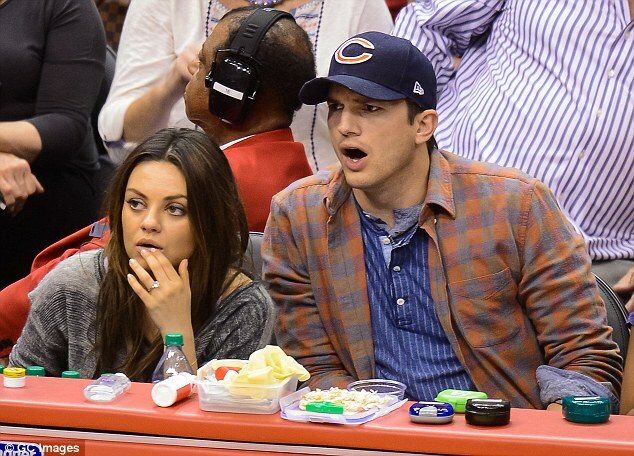 ‘Ashton and Mila were absolutely not friends during much of the making of That ’70s Show. In fact, they couldn’t stand working together,’ an old friend of the couple’s told RadarOnline of the series that made them household names that ran from 1998 until 2006. The insider added: ‘The two were never close on the set. Quite the opposite!’ adding that apparently after Ashton’s split from wife Demi Moore, ‘Mila was the one who came forward to bury the hatchet. 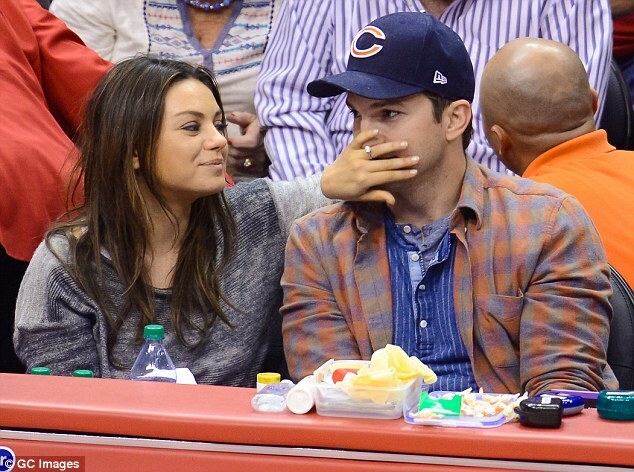 The happy couple, who have been dating since April 2012, reportedly got engaged in late February, with reports stating that the actor asked Mila’s father for his approval before popping the question.